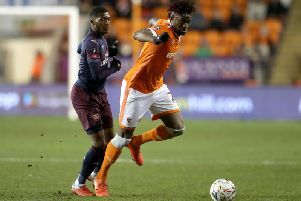 Town midfielder Pelly-Ruddock Mpanzu admitted the Hatters’ rise to the position of runaway leaders this season has caught him slightly by surprise. After starting with three wins from their opening 10 games, a club record equalling 27 league matches without defeat has put Town in pole position with six games to go. Mpanzu said: “I can’t lie, it was a tough start. With second placed Barnsley seven points adrift and Sunderland 10 behind, Mpanzu would like to see both drop further ground this afternoon. He added: "Everyone says don’t look at other results, but we want Sunderland and Barnsley to slip up so it makes it easier for us, if I’m being honest. "We’ve got to focus on the next game and winning first though."